Our company nevertheless, captures automobile industries and the main reason is to enhance the beauty of your automobile. In this category we also offer different services starting from truck trailers, sports cars and school/company vehicles name branding and private vehicles. The company also repairs the damaged graphics, replacement of banners and decals and painting at cost effective price. A team of highly experienced and trained experts will make sure that the graphics stand out as the best among others. Did you ever imagine, how your car would appear if you repainted and put new graphics of high quality which will capture an audience or change your drive in style? Let’s get to know how Red Deer Signs achieves their best when dealing with vehicle graphics. Graphics on your vehicle transforms your automobile to a certain class and standard. Our company takes into account all your considerations for your vehicle transition; so are the graphics intended for commercial adverts, school or company name or just for fun? Thus a number of things are kept in the procedure to guide the experts on the process. The client’s wish is our command, so we need a directive to paint the graphics at the place and position of his choice. The model of your car may also be considered as some of them look smart and nice with their original paint and graphics. Use your vehicle to create a visual impression when driving mile after mile. Expose yourself and sell your services to potential customers through vehicle decals. Red Deer Signs Company can do all this for you, it does not matter the type of sign you need. A powerful impression is created through making completely large decals with high quality customized colours. Vehicle lettering is carefully painted on your windows or any other position as long as it can be captured as you drive by. The graphics durability depends on the intended purpose. We note the very important message you want to put across thus pick the best info to eliminate unnecessary costs. A colourful and bright lettering will depend on the type of the font used and colour used to match your theme. Red Deer Signs Company will always do the best to come up with brilliant ideas to customize your vehicle and leave it looking great. If you haven’t considered using vehicle decals for business advertising yet, this is the best time to mull over it. There are so many advantages to using these stickers on your company’s car that you don’t want to miss out on. The key to improving business sales is brand awareness. The more people who are aware of your business and what you do, the higher your chances are of making profits. If nobody has heard about your business, you won’t be able to establish enough credibility to actually sell anything. Brand awareness is essential if you have big plans for your business. That said, car graphics can become an effective tool in disseminating the information about your company. Gearing up your company vehicle with these signs can help gain more notice to your business. Truck decals are more inexpensive than other methods of marketing such as TV, print or internet advertising. What’s more interesting is that they last longer. While other forms of advertising tend to have an expiry date (would depend on your contract), you can keep your car graphics for as long as you want. There’s no pressure and definitely no reason for you to spend more on a new advertising that you don’t need yet! Most people are hard-wired to think that businesses with personalized cars are more established than those who only use generic vehicles for, say, delivery. It creates anticipation and a positive image. It also leaves a longer-lasting impression. A lot of people would say they trust a company with an official vehicle than those that don’t. Vehicle wraps are a cinch to change when needed. If you have new promotional offers, for instance, you can change your old vehicle decal and replace it with your new offer. There’s no need for extra manpower to update your advertising, giving way for further cost effectiveness. While big, stationary signages are effective, vehicle decals can actually boost that efficacy because of one thing: they are mobile. You can drive your vehicle in populated areas during specific times of the day such as lunch or after work so more people can see your advertisement. Car graphics come in different forms. There are also so many sign companies out there offering their services. You would want to know which one to trust and how to make the most out of this advertising method. There are different types of decals you should consider. First is the cling type or the vehicle wraps. They are more solidly placed on your vehicle so they won’t fall off or get damaged easily. This type of decal is great for company logos or tag lines. They’re easy to remove too if you want to change them. Vehicle Graphics are more attention-grabbing. This is the visual representation of your business. Vehicle lettering is very flexible. You can even place it on your car’s windows. This type of car decal is fully customizable not only in color and the way it looks but also in durability and permanence. You need to pick an experienced company if you really want the best for your business. They should have years of experience in creating vehicle signs so you are assured that they can help you find the best design and the best place to put those signs. Every business must have a catchy slogan to draw attention and to create brand recognition. Come up with a short but memorable slogan that your future customers will associate with you. Add this slogan to your car decal design. Don’t forget to add company details to your vehicle decals. Place your physical store’s phone number, physical address and e-mail address. If you have social media, don’t hesitate to add it. Social media logos are very eye-catching. Got promotional offers? Find the best spot to place the decal. The back of your vehicle is a good spot since it can be easily seen in high-trafficked areas and has a longer chance of being read. Information dissemination is no joke. With just a sign or a strategically-placed advertisement, you can already establish a brand and increase your sales. The best way to do that, especially if you are targeting local clientele is through proper advertising signs. In today’s fast-paced business landscape, local companies are given the opportunity to think outside the box in order to amplify their presence. One popular strategy is organic advertisement, in which businesses successfully turn existing assets, say, a vehicle, into an effective tool for marketing. 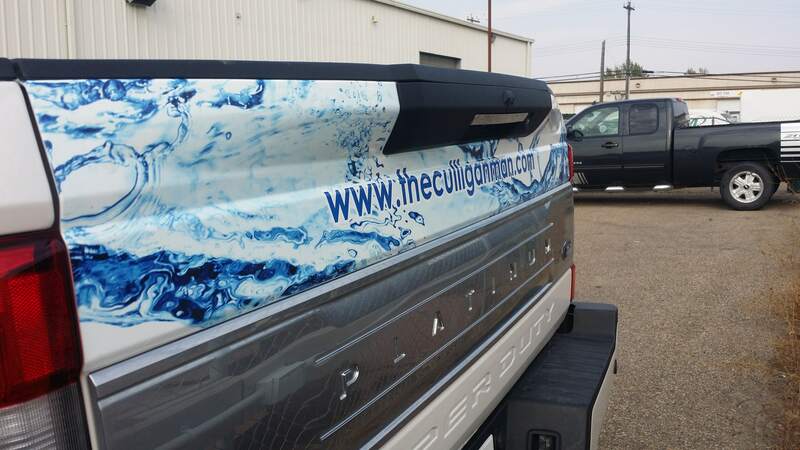 Vehicle graphics Red Deer is one way to strengthen your brand; by dressing up your fleet with decals and vehicle wraps, you can let the community know about your products and services as your cars pass by the road. Did you know that 60% of consumers would choose to buy products and services from companies they are familiar with? Recall is the key. Adding decals and wraps to your vehicle is one way to ensure that your neighborhood remembers your business. Vehicle advertising works especially well when you are targeting a certain neighborhood or geographic area. It keeps your brand visible to your chosen audience, helping you boost your business without paying for other types of ads. For those who use their vehicles in logistics, services or visiting clients, using a branded vehicle underlines your professionalism. It fosters customer recognition. You are letting them know that you take your business seriously, and this in turn creates a good impression. Compared to print ads and stationary signage, vehicle graphics and vehicle wraps Red Deer boosts your audience scope due to the fact that it is mobile. When you drive your vehicle during the crowded areas at the best time of the day, more people get to see your advertisement. Advertising value is gauged per thousand impressions. There is a reason why a 30-second commercial on television is so expensive, compared to the less-dynamic radio announcement. But with vehicle graphics Red Deer, you get the chance to bypass restrictions in rates and placement. By simply driving your van around the neighborhood, you create a buzz and increase your brand’s awareness. By using your branded vehicle, you can reach as many as 70,000 people per day. Survey says about 30% of pedestrians and motorists base their purchasing decisions on the ads they see while commuting. Your ads will not be ignored; 95% of people notice these wraps and decals, giving you the power to boost your sales and impression in one sitting. This form of marketing takes every opportunity to grab attention; it works when the car is moving or on stop by the red lights. An eye-catching design makes the best impression. At best, keep it to a minimum. Make a logo that will strongly identify your business. Add a list of services, even a short tagline, to set you apart from the competition. Legibility is essential. Use contrasting colors to emphasize the more important areas of the design. Your goal is to make them contact you back. Make sure to include your company’s website, email and phone number so they can reach out to you. Make your URL prominent, as people are more likely to go online to view your products and services. Once you have planned the design of your vehicle graphics, it is important to choose an important provider to install the designs for you. Consider the color and durability requirements of the material. A local graphics company in Red Deer is your best choice, so you can easily communicate the changes you’d want to highlight. Pick a well-reputed, experienced provider that will give you the freedom to select decals and wraps that matches your standards. Know that with Vehicle Graphics Red Deer, you have a variety of options. Basic lettering is one of the simplest ways you can convey your message through your vehicle branding. We’ll help you stand out by using the best colors that matches your business style. Decals, on the other hand, are perfect for logo and other graphics you’d want to add to your vehicles. We’ll place them on the most noticeable parts of your car, such as the sides and the rear. When you’re ready to move further, check out our vehicle wraps. We will cover your car with a eye-catching visuals that will match the tone of your vehicle, making the design meld with your car. Choose from partial to full wraps. These will not interfere with your vehicle’s paint job and adds a layer of protection to it. Vehicle graphics Red Deer gives your company the attention it deserves. The best part: it lasts you for years! Make use of this powerful marketing strategy. Call us today to inquire about our vehicle wraps and graphics!